Our park kitchen is a clean space with one large commercial electric oven and eight electric cooktops. Also plenty of food preparation wash up area. 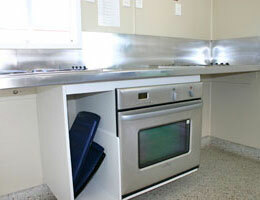 Use our camp kitchen while staying on one of our campsites or standard cabins. The park laundry houses a double dryer and two large washing machines. 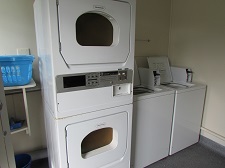 Each of these appliances is coin-operated ($4 per cycle for washing machine, $2 per cycle for dryer) and washing powder can be purchased at the office for $2. There is also washing tubs, an iron and ironing board and a vacuum cleaner in the park laundry. A number of washing lines are positioned right by the laundry for your convenience. Our men’s and women’s bathrooms have a number of showers and toilets for guest’s use. There is no charge for showers here at Cosy Corner. There is a hairdryer in the women’s bathroom and a shaver point in the men’s. There is also an outdoor shower by our park pool if you’d rather just grab a quick rinse off on your way back from the beach! Cosy Corner Holiday Park is now a wireless hotspot. So if you have to keep in touch with work, or just enjoy emailing and net-surfing while you holiday, you can relax back on your beach chair, pull out your wifi laptop and connect instantly throughout the park.